It's kind of a joke around my kids school that I know what's going on before most other parents. I've even had to wrestle with finding out information about things that happened with other kids at school and deciding whether to tell their parents or not...but that's a whole other blog post! 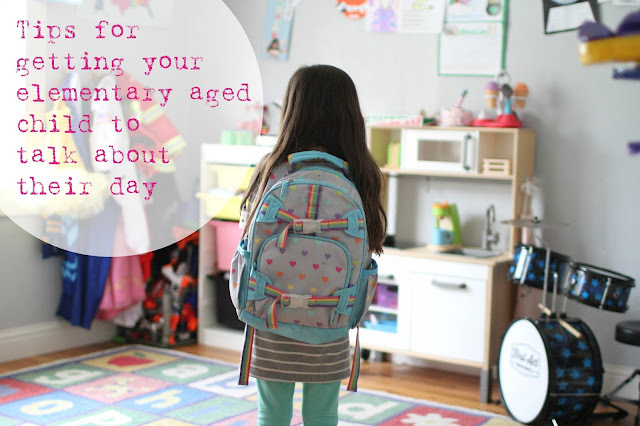 Because of this, I thought I would share some tips of things that work for me on getting my kids to talk about their day. Kids are like those scarves magicians pull out of their sleeves, they just slowly keep going and going and going. That's how conversations about school tend to go. They don't spill it all at once. It slowly comes with the right amount of time and space, and the proper questions asked. And here's the thing, if we don't make time for these conversations now, we won't have laid the foundation, built the relationship with them for the really hard talks we want and need to have with them as teenagers. I have always held picking my kids up from school very dear. I can instantly gauge how their day went. It allows me to know if we need to immediately talk seriously about the day (like if there are tears, extreme awkwardness or sadness) or if it can more naturally come out as the day progresses. If I can tell something happened at school, I stop everything we are doing and make sure I get to the bottom of it quickly. Sometimes that may be instantly. Finding a quiet corner in the school yard to talk. Other times it happens on the walk home or even cuddled up together on the couch or in a bed as soon as we get home. But on a normal day, the details of the day tend to come out more slowly. 1. Make space and time to talk - I usually find some alone time like when reading a book together, running and errand (I swear being in the car just makes my kids want to tell me every detail of their life! ), or playing a game a good time to talk. But if there's no time for talking, it won't happen. This is especially important with siblings in the picture. I notice my kids don't like to talk about any problems at school, academically or socially, if others are around. This also tends to be the case even if both parents are around. They seem much more open if the conversation is just one on one. Which is why, even if I hear them opening up to their dad and really want to know about it, I resist the urge to barge in and listen, but figure I can ask my husband about the dialog later. 2. Ask open ended questions, not yes or no questions - There is definitely a place for yes or no questions, but if you want to get your kid talking, open ended questions are the way to go. And make sure to tell them "I don't know" isn't an answer! Sometimes yes or no questions can be great precursors to open ended questions. Did you have PE/art/computers/enrichment today? Then you can go on to ask open ended questions about that class or extra curricular. 3. Ask specific questions - "How was your day?" can certainly be a starting point, but isn't going to get them to talk specifics. And if I ask less specific questions, like what was your favorite part of the day, I tend to get answers like "I don't know." So I find the more specific questions about events that I know happened at school that day help spur on conversation. I also find it importation to already know the basics about their school set up, so I know what questions to ask. Like who they sit by in class and how they feel about that person. If it's a less than desirable desk make, that can take up a lot of talking most days. What was your favorite thing you ate at lunch? Today was library day, what book did you pick? Why that book? Were there any other books you were interested in? What did you play at recess today that was fun? How did you do on your spelling test? Were any parent volunteers in your class today? What did they do with you? Were there any birthday parties today? Who's? 4. Reassure your kids they won't be in trouble for anything they tell you - and mean it! That doesn't mean there aren't natural consequences for their behavior, but make you a safe person for them to talk to. This means not overreacting to things they do tell you. I like to remind my kids that it's better for me to hear something that happened from them than from a teacher. Most of the issues we have had thus far have been misunderstandings. Things like not knowing what the middle finger means, but someone showed you it so you give it a go. And this is a good time to remind your kids to ask YOU what a word or gesture means that they learned before using it themselves. School can be brutal. Kids are exposed to new things all the time that they really have no clue sometimes what they mean. Be sure to be the safe, calm, loving person that explains it to them...then explains why not to use those words. Not to mention, when a lot of kids are saying things on the playground that really aren't appropriate to say, it's important to explain to your child why that isn't important, rather than just telling them not to say it. When my kid had their middle finger incident at school, a teacher (who wasn't theirs) got upset at them, yet refused to tell them what it meant. This left them upset, confused and frightened. This particular teacher threatened to take them to the principal's office over it. In my opinion, the situation wasn't handled correctly at school. Which probably happens way more often than we would like. This means it's all the more important to handle it correctly at home. School is hard. It's draining on kids. Make sure their time with you is a time of building them up, not tearing them down. Focus on their strengths. It's easy for kids to get down on themselves for a bad test score or not being good at a sport on the playground. Be sure you are loving them and building up their confidence at home before sending them back to school. Home needs to be a safe place. A place they can be themselves without being picked on for that. Raising kids is hard. We all get it wrong all the time. Anyone who says they don't are lying. But learn to be humble. Learn to ask you child for forgiveness when you've overreacted to a situation. Kids are resilient. They forgive easily. And they notice when you love and try again the next day.